504 Loan Calculators give CDCs all these features. 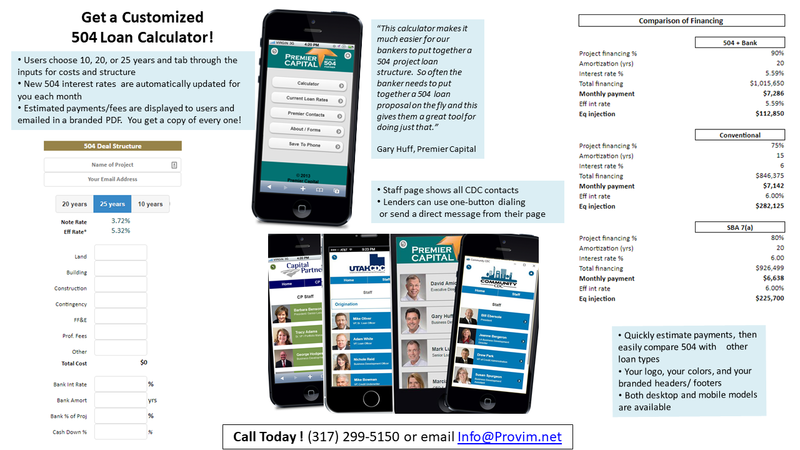 These 504 loan calculators were developed jointly by Premier Capital Corporation and ProVim, and are being used by CDCs (certified development companies) across multiple states in the US. They have the effect of building relationships with bankers and other lenders who are increasingly using smart phones and other mobile devices for conducting business at any time and any place. 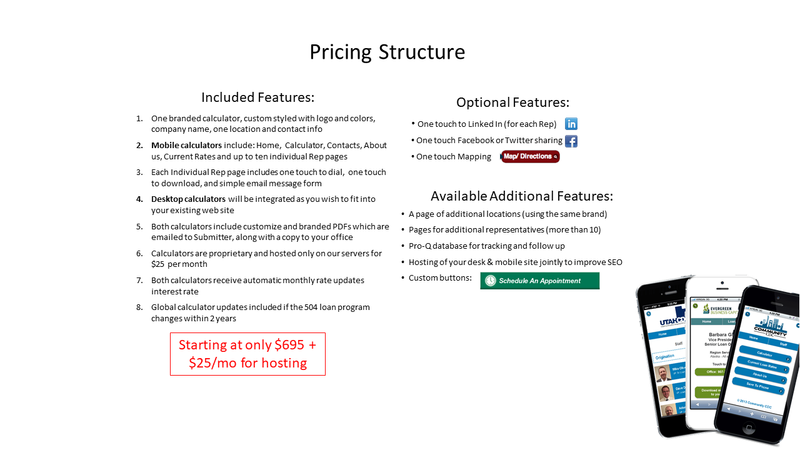 Each 504 loan calculator is a mobile web site, not an “app” (application.) Unlike an app, they require no downloading, no updates, and no special skills to operate the calculator. Any banker or lender will be easily able to input a project loan and quickly see the estimated payments. He can then immediately email the results in a branded PDF to the proposed client, himself, and the CDC office. This quick and easy loan promotion is well received by leaders of banks who recommend it to their loan officers. The 504 loan calculator is a web page in a browser, customized for viewing on a smart phone, and we keep it updated with no effort required by the CDC or the lender who uses it. When monthly rate changes come out, we update the system so that each CDC has their current rates showing quickly. For more information, please contact Tim at 317-644-6850 or fill out the form below.